With my studio now festooned with warning signs, it is time to turn my attention to documentation. Thank goodness for ISO 9001. All this time, until now, I thought I was just an artist. But in fact it turns out I’m running a very complex organization. 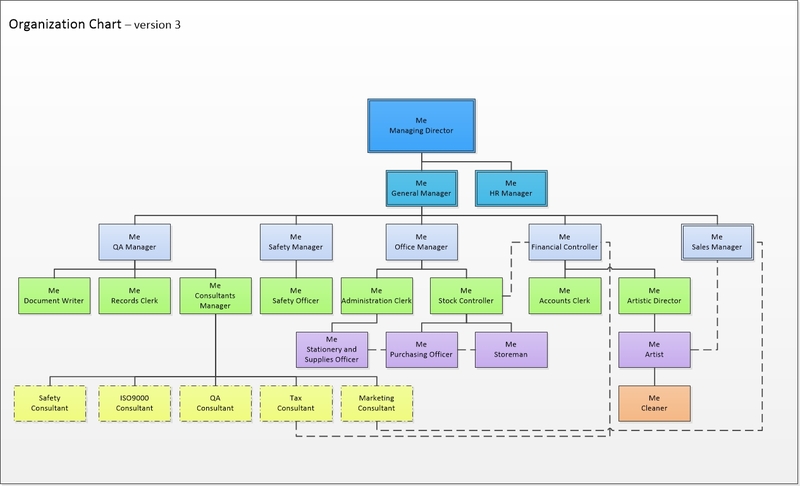 To get to grips with the structure of this organization my consultant stressed that I must produce an Organization Chart. Otherwise the whole thing was in danger of imminent collapse. Step 1. Produce Organization Chart (version 1). Seek feedback from ISO 9001 consultant. Result: Totally inadequate. A business could not possibly function under this setup. Step 2. Produce revised Organization Chart (version 2). Seek feedback from ISO 9001 consultant. Result: Is this a joke? Where is the management team? I need to start taking this more seriously. Step 3. Produce revised Organization Chart (version 3). Seek feedback from ISO 9001 consultant. Result: Much, much better. However – purely as a general “heads-up” for the future – with so many positions being maintained by the same person, the possibility of conflicts of interest should be considered, with the subsequent need to hire other individuals to take over some of the roles. Also, on the negative side, the consultant took deep offence at his position on the chart. This needs redressing in order for further consultancy expertise to be provided. Step 4. 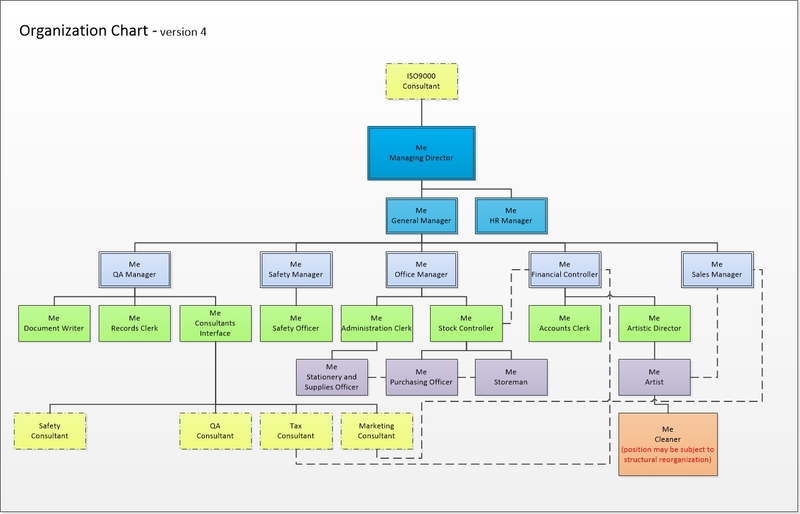 Produce revised Organization Chart (version 4). Seek feedback from ISO 9001 consultant. Result: Perfect. The consultant pointed out that the Chart should be regarded as an “organic” document. I took that to mean that its growth is enhanced by the application of natural fertiliser … But no. In the corporate world it simply means it should be constantly updated to reflect changes in staff positions. The only change unlikely to occur was any involving his position at the top. Addendum: There are rumblings of discontent amongst the general staff about uncertainty and ambiguity surrounding the “dotted line” reporting paths. Further, there are indications of possibly irreconcilable differences, on creativity grounds, between the Artistic Director and the Artist. And, in the transition from version 1 to version 2, I was disappointed in finding myself, as artist, at the very bottom of the pecking order. So, in version 3, I quietly created the position of Cleaner beneath me to give me somebody I could be in charge of. This wasn’t a good move. It was noticed, and now a fight has broken out between the Office Manager and the Safety Manager who each claim that the cleaner should come under their specific control. It looks like it could come to blows. The HR Manager will need to sort all this out.